I wanted a puppy - an all white GSD puppy but after being at a house (I am a Computer Field Tech) that was part of a GSD rescue group i suggested we rescue one instead, she was not to keen on it but agreed, so i started to look for GSD's in my local area to help, one day after searching the internet for about a week i found our new dog. only one problem he was afraid of people. The guy at the pound opened the cage and Bandit (which we renamed wickett...think of the bear like things from star wars) sat in the corner and wouldnt move and just growled under his breath at me. right then and there i knew i needed to save this dog. So i sent my fiance to see him and wouldnt you know it wickett ran right to her and melted her heart. no question about it he chose her, which is good because thats one of the reasons we got him to protect her. Now to the problem other than my fiance he is afrraid of everything, for example the wind, tables, vacum cleaners, people, pillows, non carpeted floors, doors, his food bowl if you touch it while he is watching, he also doesnt take food from us or anyone, if we try to give him a bone he runs away and waits for you to drop it then he will take it when your not looking. all this while he is in the house. If he is outside he is not afraid of anything but other people. He walks great on the leash right next to you doesnt pull at all, loves car rides too. I want to train him but he is to afraid when i tell him to sit he puts his ears down and his tail between his legs. I cant motivate him with food because he wont take it from me. I want to help him get over his fears and slowly he is getting better he doesnt seem to be afraid of me anymore. But he will not take food from me or my fiance treats nothing. 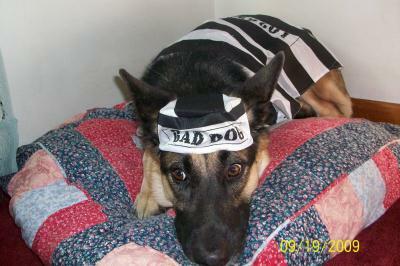 Please any help would be great - no GSD should live in this kind of fear ever. Now the story of why wickett should have been called bandit, after we got him and a few months had pasted we noticed that we started to only have 1 sock and no more pairs, well 1 night my fiance was watching t.v. and she noticed the dog was sneaking out of the room and followed him, low and behold he stole one of her socks and was laying with it. where the rest ended up no one knows, since then after laughing at him he no longer does it when no one is looking now he just sneaks over and grabs the sock then runs with it like a bank robber being chased by cops. he doesnt chew them he just lays with them then they disappear. If you can help me or have suggestions please let me know. P.S. he lets my fiance do anything to him as you can tell from the picture...he has about 6 costumes, 7 coats\vests, and a pair of boots... yes i said boots and he wears them too. My GSD just about hit the ceiling the first time he heard dishes in the sink and the ceiling fans in all the rooms are still a major source of concern for him. However, I wouldn't let him run away. He had to stay in the same room and just learn to deal with it. I didn't get frustrated or annoyed. I just got him and brought him back to the room if he bolted. He had to stay with me at all times. I gave him a great deal of One on one time and I started taking him to doggie daycare once a week. I will say, that he is currently a 95 lb couch potato and sort of a wuss. He's not real fond of getting wet, etc. But i insist that he act like a dog and he's made great progress. Patience is the key. Cesar Milan has said many times that a fearful dog is the hardest to work with because you can't rush it. You just have to be patient and continue to work with them. It will come. We do take him to stores and out with us the problem is when he is on the leash with me he knows i wont let anything happen to him so he isnt as fearful, its when he is in the house and not on the leash is when he is the most affraid. he is getting better we had him almost a year now but he is still very odd in the house, he did have medical issues when we got him and thankfully he is doing better but that doesnt explain the odd behavior in the house he acts like he is a 80 year old man and outside he is like a puppy running and hopping around the yard nipping at me if i ignore him for more than 2 seconds but once back in the house 80 year old man again. he just started to bark when someone is at the door. it took him 7 months before he made a sound. I adopted a 2 year old extremally fearful GSD about 15 months ago. You cannot force change on them. However we established a regular routine and with a great deal of patience and not babying him when he was fearful, he has changed a great deal and developed a lot more confidence. I didn't react when he was so fearful, and didn't shy away from exposing him to new things. However that was a little bit later in the relationship. He's very wedded to his routine, however, but a sweeter dog I've never had. I've dragged him into stores, exposed him to many new situations to help him gain Self confidence and after 15 months of hard work have a great GSD.